I like to joke that the first place I ever ate grits was in New Hampshire, which is arguably the southernmost state in New England. In reality, though, I ate plenty of grits as a kid–we just called it polenta. That said: fish and grits is an undeniably southern mash-up, a bit less upscale that its more sophisticated cousin, shrimp and grits. It’s a catfish meal, if ever there was one, but we all prefer a lighter fish–and I see no reason to be that much of a traditionalist. And speaking of messing with traditions: the cheese grits below deviate from “true” southern grits in a few notable ways. First, I use quick grits, and if you know nothing else about cooking grits than what you learned from My Cousin Vinny (“What’s a grit?”), you know you should be using twenty minute grits. Second, I make my grits a lot looser than the back-of-the-bag recipe (4-1 water ratio, instead of 3-1). Finally, I use mascarpone and Parmesan cheese instead of cheddar–a combination that I picked up from one of Joshua’s recipes, when he went to cooking camp a couple of summers back. Heat 4 cups of water to just under a boil. Add 1 teaspoon salt and slowly add the grits, stirring constantly. When the grits start to bubble, lower to a simmer and continue stirring for about five or ten minutes. The grits will have thickened considerably, but should still look pretty loose. Let simmer for another five minutes, stirring occasionally, making sure to keep anything from sticking to the bottom. After five minutes, remove from the heat. Heat about 3″ of canola oil in a cast iron pot. You want to get to around 350 degrees. Combine the flour, corn starch, salt, pepper, and paprika in a shallow bowl. Add 3/4 cup water and whisk until smooth. Wash and pat dry your fish filets. When your oil is at temperature, batter each filet individually and fry in small batches. Remove to paper towels when crisped and reddish-brown. As your last batch of fish is frying, add the grated Parmesan cheese and mascarpone to the grits, which should have thickened considerably off the flame. The grits should still be plenty hot to serve, but letting them sit for five or ten minutes before adding the cheese will help keep the cheese from glomming together (less of a problem with Parmesan and marscapone, but an essential tip if you are using cheddar). Serve with salad and a bottle of hot sauce and you are good to go. This entry was posted in Uncategorized and tagged grits, seafood, southern, summer. Bookmark the permalink. Your meal sounds terrific,,. nicely seasoned. 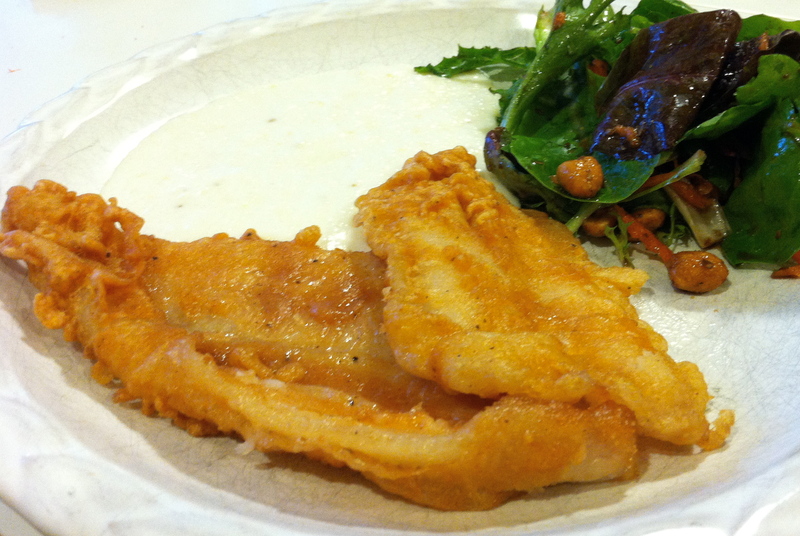 I like catfish but prefer sole or flounder as it is so fresh here in New England. I guess I am showing my New England roots in my choice of fish!